We heard it was cold, flu and fever season but we never thought we would catch such an illness down here in Florida. After all, those are illnesses for folks in the northern states where the snow and cold are contributing factors. So we were confused and bewildered the other day when we found ourselves getting hot and sweaty one minute and having the chills just seconds later. It all started one day while Barb and I were at a patio restaurant baking in the hot sun. We soon found ourselves with a fever-like heat running throughout our bodies. As soon as we took a sip of our icy cold piña coladas we got the chills. A very perplexing situation indeed. Soon, we would find ourselves sweating again and again after a sip of our drinks we got the chills! After numerous repeated episodes with the same effect we came to the startling conclusion that we had FLORIDA FEVER! We quickly looked it up on the internet and found that this specific strain of fever inflicts northerners when they come into the area. Symptoms included hot sweats followed by the chills after sipping an icy drink. Yup, that is exactly what we had! Reading on we discovered there is only known cure for this epidemic……..continue to drink piña coladas while gorging yourself with delicious food followed by a few hours of rest…..so that is exactly what we did. Eat, drink, rest, eat, drink, and rest. It was a grueling few days but we managed to break the cycle and soon we could drink our piña coladas without getting the chills. Whew! So that is how we spent our week visiting my sister Judy and her husband Mike. Along with their Balsam Lake friends, Steve and Sherry, Pam and Arnie and Sherry’s dad Bill we had a great time visiting and sampling some of the local restaurants; The Tiki Hut, Gator Bites Tail and Ale, Doc Fords, Bonita Bills, Harpoon Harry’s, Lani Kai, Nemo’s, The Beach Pub, The McGregor Grill, Red’s Seafood…….The seafood in this area is incredible! I don’t know if it is the variety of shrimp or just the “off the boat” freshness but we had some of the best shrimp of our lives. We tried to decide what our favorite meals of the week. Mine was the Crab Crowned Grouper at Red’s and Barb’s Shrimp/Spinach/Gorgonzola Pasta also at Red’s. The shrimp and clam strips from Harpoon Harry’s were a close second. This guy was swimming off of Fort Myers Beach.....Dolphin or Shark???? Food aside, the best part of the week was seeing our family and friends. We put the rig in storage for the week and stayed at Judy and Mike’s house. If you can find a site, RV Parks in this area start at about $50/night and $70+/night is not uncommon. The storage facility we used was only $5/night and was within 5 minutes of Judy’s house! More money for going out! We also visited with two other couples who were in the area; Roger and Judy, our neighbors on Bone Lake in Wisconsin were in the area so we caught up with them for lunch one afternoon. 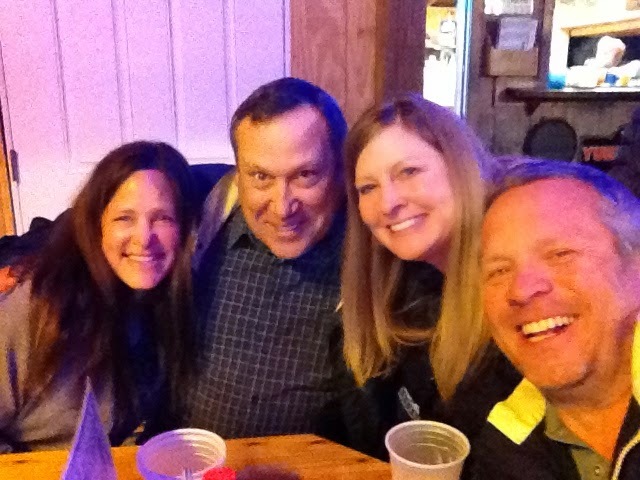 We also met up with a former Washington County co-worker of Barb’s. Shirley and her husband Alan have a home in Port Charlotte about an hour away from Fort Myers. We met up with them one afternoon for some great food and shopping. We also had a huge change in plans for the summer. We had originally planned on spending the summer in Canada like we did last year but after hearing about an awesome job that our friends Steve and Joan landed we decided to apply for one of the remaining couples positions and got it! Steve described the position so eloquently I decided to steal a paragraph from their blog rather than try and describe it myself. From Steve’s blog: “The job being offered would have us working in Idaho, Montana, Wyoming and possibly Utah & eastern Oregon this summer. We would work 40 hours/week, drive our personal 4-wheel drive vehicle, utilize a provided tablet and GPS device to map BLM roads throughout the designated areas. Joan and I (and now us!) would be one team in a group of multiple teams that traveled and worked together for the season. The entire group would move to an area and set up in the same campground. Then each individual team would be assigned their own BLM roads to cover. Once an area was completed, the entire group would relocate to the next area to be mapped. The company picks up our campground fees, fuel costs for relocations, fuel costs for personal vehicle use, per diem for each day your personal vehicle is used and a generous hourly pay rate for both Joan & I. We would be in an area for a few weeks before moving on to another”. Although we are going to miss the fishing, hunting, adventuring and all our friends in Canada, we are really looking forward to this opportunity. And bonus……we get to spend the summer with some great friends! So…….we rearranged all our plans for the next two months. We need to head up to Wisconsin early (ya in March!) to pick up the Jeep and Ranger then head out west to wherever we start for the year. Not really looking forward to driving in the snow again. We are also going to take advantage of this northern trek to stop by Mor/Ryde in Indiana and get a new suspension system installed. This will fix our overweight issue, beats going on a diet! The week went really quick and before we knew it, it was time to move on to our next destination. We hit the road, looked at a map and decided to stop in the Osceola National Forest for the night where we will look at the extended forecast and plan our route north. After signing up for the RV Dreams Boondocking Rally almost a year ago, the day has finally arrived and we are here in Arcadia Florida. This is an educational rally and gathering of likeminded RV’ers who have a passion or interest in boondocking (camping without any water, electric or sewer hookups). There are FT’ers, PT’ers and dreamers here for a total of 30+ rigs. The first afternoon consisted of people arriving, getting set up and meeting each other. This was followed by a gathering of everyone in front of our hosts rig, Howard and Linda, for a dinner and an overview of the week. Afterwards we hung around the fire and met some of the attendees before turning in for the night. Our first session was on water conservation. Howard and Linda thought this was a topic best addressed early in the week rather than later before everyone burned through their water for the week. They went over various ways to conserve water while boondocking, One of the things was to get to know your rigs capacities. Our rig has just over 70 gallons of fresh water capacity, 70 gallons for gray water (shower and sinks) and 30 gallon black tank (toilet). Next up is to learn exactly how much water you use in a given day. Our best estimate is that we use approximately 7 gallons a day without trying to conserve too hard. That means we should be able to go 10 days pretty easily without running out. Our next session was on battery and solar systems. The batteries are really the heart and soul of the rig when boondocking. Without battery power, you are literally dead as it is the batteries, not the solar, that give life to your rig. The role of the solar is to charge the batteries, the battery charge then runs through an inverter converting the 12 volt DC power to 120 AC power which in turn allows us to run our electrical items in the rig. We are wired up to run almost everything when running on our battery bank; TV’s, microwave, all the outlets. The only things it will not run are they AC units, central vac and fire place. They just draw too much power. We had our solar/battery system installed at AM Solar last year. They had designed our system based on the size of our rig and how we planned to us it. After listening to this session Barb and I were glad we did what we did. We had plenty of batteries and solar panels to do what we needed to do. Good news! The next day was weighing day. It is very important that you understand your total weights as well as the weights of both your truck and trailer wheel by wheel. Being overweight puts strain on your tires and axles. Being out of balance with too much weight on one side of the rig can affect the wear and ride as well. Here, we did not receive as good of news. Our truck was fine, the weights and tires we installed were well within the capacities of the truck. The trailer was another story. We were significantly out of balance and pushing our limits on the overall weight. The driver’s side of the trailer carried much of the weight; refrigerator, microwave, stove, TV, fireplace. In addition, this side of the trailer is where the majority of the storage is leading to additional weight on that side. To top it off, we have over 400#’s of batteries on the driver’s side as well! As a result, Barb and I spent the afternoon rearranging. We moved as much of the heavy stuff from the driver’s side to the passenger’s side to balance it a little better. As far as the overall weight goes, we were told that we have great tires (Goodyear G114) but we are going to look into upgrade our axles from 6,000 # axles to 8,000 axles. This will give us some wiggle room so we won’t have to worry about it in the future. Thursday was kayaking day, we had a blast kayaking 9 miles of the Peace River with about 17 other couples. It was in the 70’s and the 3 hour trip was more of a float as the current did all the work. The only thing we had to do was steer and enjoy the scenery. With all the informational sessions done all we had to do the remainder of the week was relax, sit around the campfire and enjoy the company of the other attendees. We met some unbelievable nice people; full-timers, part-timers, there were a surprising high number of “2014 graduates”, those who started their full-time lifestyle in 2014. There were quite a few fellow bloggers here, some we had read before while others were new to us. The bloggers included: Bill and Kelly, Trace and Lee, Jami and Shane, Jo and Craig as well as Jim and Peggy. Greg and Cori own a solar installation business, if you are ever in need of solar on your rig, check them out at RV Solar Solutions. It was a great week and we learned a lot. We were able to make the week without a problem without turning on our generators, emptying our tanks or taking on fresh water. Sunday morning we packed up and said our goodbyes making plans to meet up with several people throughout our travels out west this spring and into next fall. Now it was time to travel south another hour to my sister’s house in Fort Myers. We have not seen her and Mike in several months and we are really looking forward to seeing them! 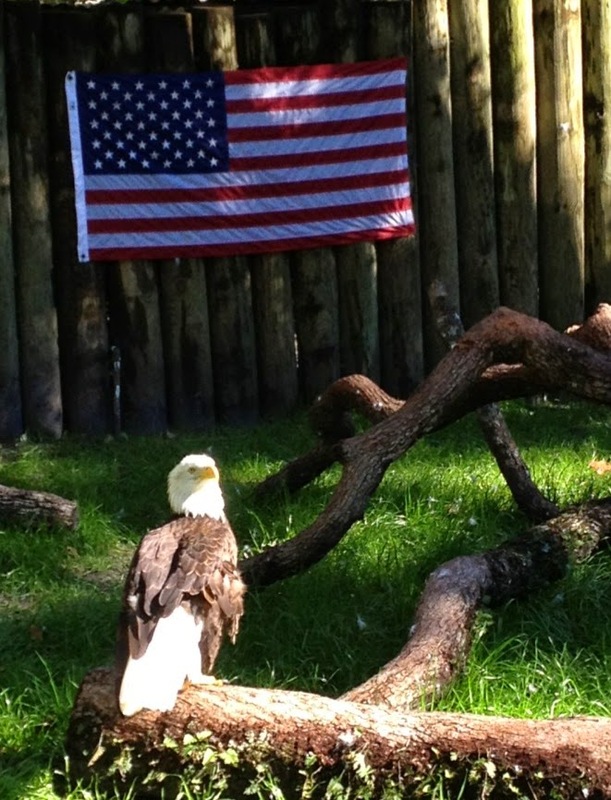 Don’t Ever Stop by Dunnellon Florida……..Ever! The only reason we stopped by this area of Florida is because our friends Dan and Jeanie own a house here and we wanted to see them. During the summer they live on their ranch in north central North Dakota where they run a waterfowl/upland bird hunting operation. We have a link to their place on the right hand banner of our blog page. Speaking of our blog page, I know many of our readers receive our posts through the “follow by email” section. Although you get all the posts, you don’t see the information on our side banners such as; Our Favorite Blogs, Links to our Favorite Places, or a link to Our YouTube Videos. There is also a comment section at the bottom of each post where readers can comment. We love to hear from those who are reading our blog, sometimes we wonder if anyone is reading it! Here is a link to our actual blog and I will try to remember to add a link on each post. As I was saying, the only reason we stopped by was to see Dan and Jeanie. They bought a house down here last year to escape the cold North Dakota weather. They absolutely love this area and are afraid if I blog about it everyone will come here and it will become overrun with RV’ers and tourists. 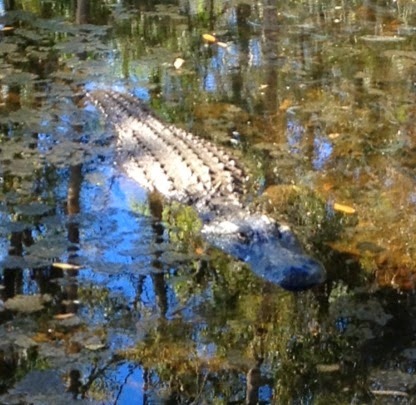 So, with that I will start my post on why you should never stop by Dunnellon Florida…..ever! 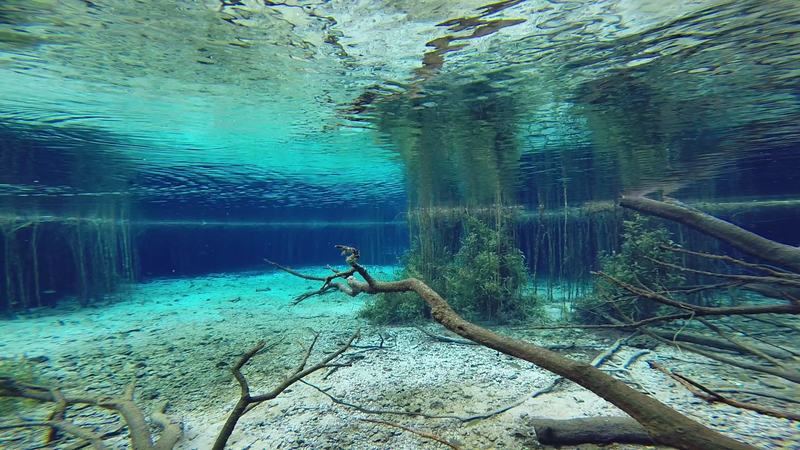 The Rainbow Springs River is one of the main attractions in the area and we went kayaking on it a couple of times. We had a horrible time and as you can see from the pictures and the video I made of this trip, the river is filthy, dirty water and you can hardly see into the water. The banks and littered with garbage and there are no fish in the river. Again……no reason to ever go here. The next day was equally as bad. 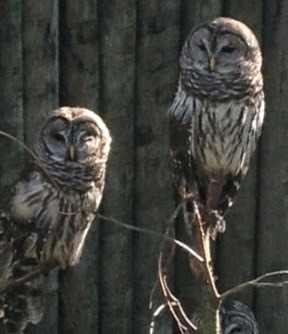 Barb and Jeanie went to the zoo and did not see any cool animals while Dan and I went fishing and I did not catch Redfish, Sheepshead and Ladyfish, three fish species that I have never caught before. 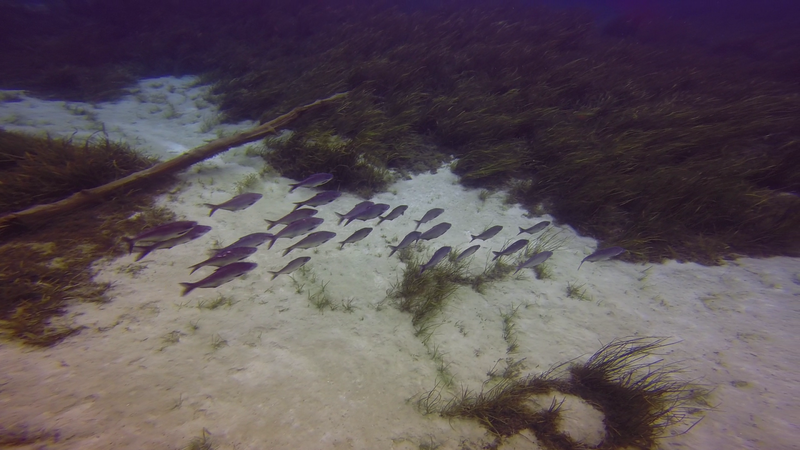 The sheepshead here are not at all like the sheepshead we have up north. 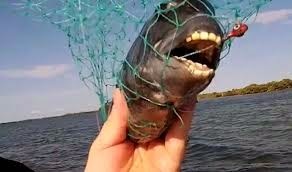 These sheepshead are actually a very sought after table fare and have really weird teeth. After fishing, Dan and I returned to the house to find that Barb and Jeanie had stopped by a seafood shop and picked up 5#’s of stone crab claws and a ½ a bushel of Oysters. We shucked about ½ of the oysters flavored them and grilled them. The other ½ we cooked whole on the grill until they opened. The stone crab were boiled and eaten with drawn butter. It was a gluttony of seafood and the meal was horrible. Again, no reason to come here for the fresh seafood markets. One of the main things we wanted to do here was see the Manatees! Barb had been obsessed with manatees for years ever since we have been planning our fulltime life. She even has a cute little manatee dance that she does when she talks about them. I wanted to videotape it but she would not let me. Manatees are related to the elephant. Adults can weigh as much as 1,800#’s, live 60 year years old and be over 12 feet long! 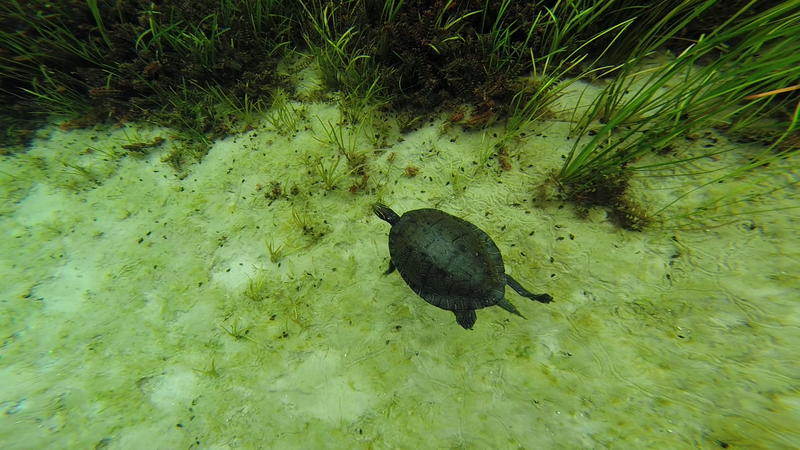 The babies are 3-4 feet long and weigh up to 70#’s at birth. So how did our manatee adventure go? There are no manatees here at all, you cannot swim with them and we did not see any at all! 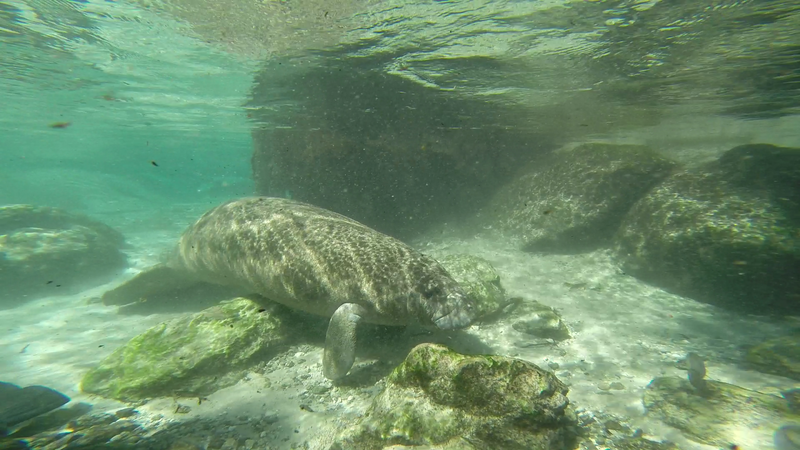 Below is a short video of us not seeing any manatees at all. 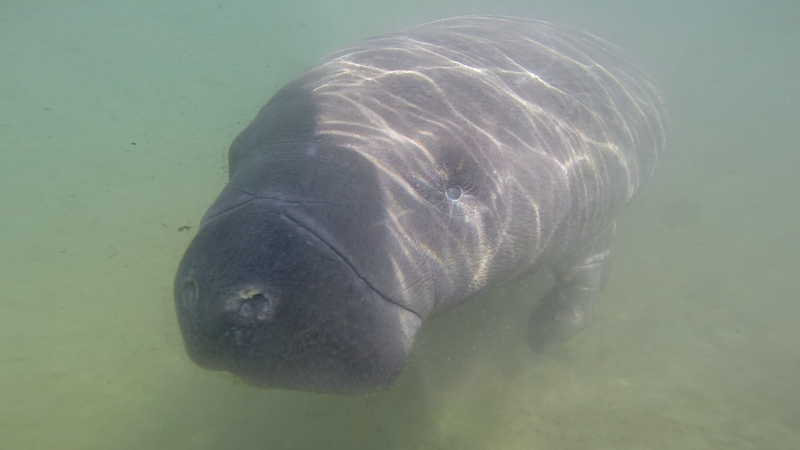 There is certainly no reason to come here to see manatees. 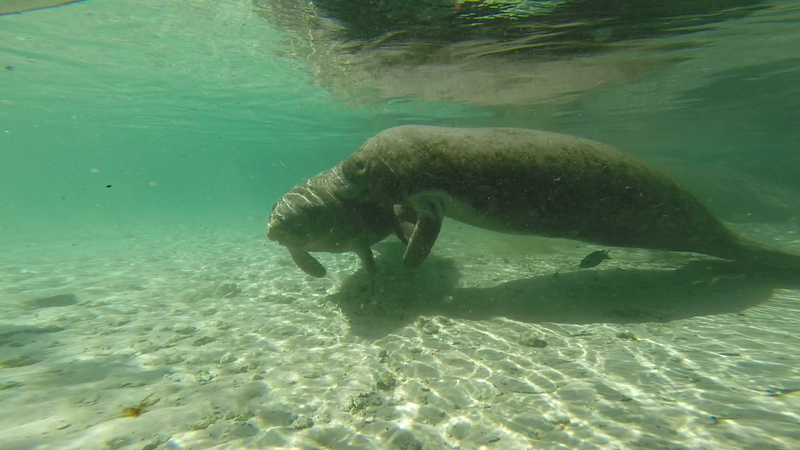 We got some fishing in on our Manatee adventure too. Jeanie was a little cold! On our last night here we went out to dinner and a bar with a live band. The food sucked and music sucked making for a horrible evening. We did not have a good time drinking, eating and enjoying the good company. There is no reason to come here for the food and entertainment. The Rainbow Springs State Park is very nice and clean. There are a number of nice sites for big rigs. We had site #20 but #'s 7,8,9,10, 18, 19 21 & 22 were also very nice. On a serious note, last week a reader and frequent commenter said that it looks like we are on our honeymoon. There is no doubt in my mind that this is true. This week Barb and I celebrated our 29th wedding anniversary and I can honestly say that our love for has continued to grow throughout the years. In some ways I feel like this is the first anniversary of our new life. I can only imagine what the next 29+ years will bring! Postscript to Dan and Jeanie (no one else should read further)…….True to my word I did not write one positive thing about Dunnellon. I think I successfully portrayed your area in a manner that no one will want to come there. You live in one of the most beautiful areas we have seen. There is so much to do that we only hit a portion of it.Thanks for the great time and we will definitely be back! Our bayou journey started last week when we entered Louisiana and continued through Mississippi, Alabama and now into the panhandle of Florida. One thing that has become painfully evident (in both our wallets and waistlines), is that our activities out east are centered around eating versus out west where they were centered around hiking and other outdoor activities. There is so much good food out here that you just cannot go through an area without trying their local cuisine! Nest stop.....New Orleans. Mardi Gras, Bourbon Street, Katrina, the Saints.....these are some of the things this city is known for. Our knowledge of the city is limited to what we have seen on TV and really did not know what to expect when we arrived. Bayou Segnette State Park is located within a few minutes of downtown, there are about 100 sites all with water and electric. Off season the rates are $20/night, free laundry and Wi-Fi are the same as we have experienced in our other Louisiana state parks although not as clean. The sites themselves are fairly open and well spaced. We spent our first full day in the city, we wanted to do it on the weekend to get the full affect. We drove to a parking area about 20 minutes from the park and took the $2 ferry across the river. I have to say the city was cleaner than expected. Although Mardi Gras is still several weeks away, the streets were bustling with street performers, musicians and people taking in the sights. Most of the musicians and performers were pretty good but there were a handful of really bad ones trying to make a buck. The streets are very narrow and are lined with bars, restaurants and small shops. Beignets, Po` Boys and Pralines were the most common items advertised at the restaurants. We were told that we had to try the beignets and chicory coffee at Café Du Monde and the charbroiled oysters at Drago's in the Hilton. All three were outstanding. Most of the street musicians and performers were on Royal Street while Bourbon Street had most of the musicians in the bars. It was fun to experience but once is enough and we decided this was not a place we would want to experience after dark.....too many drunk stupid people. This group was pretty good! The entertainment committee (Barb) said she had something fun planned for the next day. She would not tell me what it was but she seemed pretty excited about it. This is usually bad news.....bad news for our pocket book. She had the coordinates plugged into the GPS and told me to follow the directions to our destination about 30 minutes from the park. We took the freeway for 15 minutes, when exited we were guided through some pretty sketchy areas until we finally arrived at our destination........The horse race track! We had not been to a horse track in years! Best of all, free to get in but this could still get expensive in a hurry. They run on both dirt and turf at this track and there were 9 races total for the day. We had a great day studying the stats sheets, watching the horses pre-race and picking our favorites. We lost most and won a couple and just before the last race we were down about $16.....not bad for a days entertainment. For our last race we decided to go crazy and bet $3 on the two longshots to win, place or show. I know some of you are thinking we lost our minds......$3 on longshots?!?!?!? But we like to live on the edge, it is all or nothing here in crazyville. The horse I chose was 19:1 while Barb's horse was 22:1. At the bell they were off......at the first turn Barb's horse was in the pack while mine was last by a couple of lengths, on the back straight away Barb's horse was actually leading! My horse.......well it was still last. Coming to the last turn Barb's horse was still leading and mine had caught up to the pack and was coming around the outside. Down the final stretch Barb's horse and the favorite were neck and neck and mine had moved into 4th........At the wire, Barb's horse won and mine came in 3rd! We were both in the money and were rich! Well maybe not rich but we were definitely ahead for the day. Fun was had by all! The next day we packed up and headed to Gulf Shores State Park in Alabama. Along the way we stopped for lunch outside of Ocean Springs Mississippi at The Shed BBQ. Our friends Scott and Detra (The Wandering Whelan Wagon) turned us on to this spot and said we HAD to stop there. Featured on Diners, Drive-Ins and Dive, The Shed BBQ is well know for their eclectic atmosphere and and outstanding BBQ. Becoming BBQ snobs, we would rate their food ahead of Rudy's and equal to The Saltlick in Austin. A beautiful beach town along the Gulf. We had a great site right along the water. We stayed a day and a half spending most of our time walking the beaches and campground. The next leg of our trip brought us into Florida to Grayton Beach State Park where we again stayed for two nights. We had originally reserved site #28 but after pulling up, it was obvious we were not going to fit so we went back to the office and moved to site #57. In reality, almost any site in the front loop would have suited us but #57 was a probably the best one on the loop. While at Grayton Beach we hiked and relaxed. We also discovered that fellow RVillagers and bloggers, Jen & Deas (Nealys on Wheels), were in the park. Jen & Deas stopped by as they were walking their dogs we chatted for a bit and then made plans to go out to lunch at a local restaurant. Since they lived in Grayton Beach for quite a while, they knew the area restaurants and suggested The Red Bar. We had a good meal and a great time getting to know each other. Lunch with "Nealys on Wheels"
We once again moved on to our next destination we packed up the next day and arrived at Ochlockonee State Park in Sopchoppy Florida. Again we stayed for two days. It is a nice little park that is quiet but very tight for big rigs. There are probably only 2-3 sites that I would feel comfortable pulling into and low hanging branches and your sides rubbing as you drive through. That night we went into town to see if we could catch the Superbowl at one of the local bars, we went to the gas station and asked where in town we could catch the game. The response?.....no where. We had to go to the neighboring town where we were able to get a good meal and watch the game. The next day we had hoped to break out the kayak and float some of the channels but the wind was so strong that we stayed on dry land and went geocaching instead. We had a great walk through the forest, saw lots of wildlife and found a half a dozen caches. We leave tomorrow for Rainbow Springs State Park outside of Dunnellon Florida where we will be visiting some good friends Dan and Jeannie who have a winter home in the area. Can't wait!